Whether you’ve finally bought a new home or that house you were wanting as an investment property, chances are that it’s not absolutely perfect according to your standards. And if so, you’re probably thinking of renovating. While renovating can be an exciting and very creative process, it isn’t something you can take lightly and do in a week like some of those TV shows out there. It won’t be glamorous or cheap, and it requires careful planning and commitment. So before you do any work, get informed. We’ve put together here a guide to give you a head start, but instead of telling you what you should do when renovating we’ve instead outlined what you should never do. First of all, you need to know what you’re getting into. Budget, objectives, time, and contractors are only some of the points you need to get your head around and research well. The number one mistake people make is that they’re not prepared enough, and once the stress kicks in they don’t know how to respond. You need a detailed plan that’ll make you ask the right questions and keep you on budget. A proper guideline will also make it easier to see how the project is going and bring it back to earth, not only before the work begins but while it’s ongoing. Trendy is cool, but it doesn’t suit everyone, and it certainly doesn’t suit forever. The whole point of a trend is that it’s fleeting. While making your home modern is great, you need to keep in mind that it’s more important to incorporate your daily routine than ‘looks’. Make your home appealing but practical. Trends also change fast, and maybe by the time you’re ready to resell the trend has already passed. Or perhaps it’s still good enough for you but not so interesting to a more traditional homebuyer. So go easy and think practical. Yes, there are different types of paint for different surfaces. Some people make the mistake of choosing paint because they like the colour or finish without thinking that it may not work on a certain surface. It’s important to choose the right paint, especially when it comes to the ceilings of a kitchen or bathroom. Cheap windows isn’t where you want to save money. True, windows are expensive, but it’s worthwhile to do some research and avoid the cheapest options. Windows will provide your home with all the natural light it needs. If you don’t put enough windows in your home then you could end up living in a cold and gloomy cave, and our guess is that’s not what you’re after. If you go overboard, however, then you might end up on display to the neighbours. It’s good to find a balance. Additionally, cheap windows will lack the proper insulation to want for your home. You don’t want extra cold air leaking into your home through the windows in winter, and in summer you want to keep the heat away. If you’re going to hire a contractor then you need to make sure they’re right for you or things could go south really quick. Try getting lots of quotes before you begin. The more you have the more price range indication you’ll get, allowing you to form an idea of what the right price should be. From those quotes, rule out the cheapest options. Sometimes contractors will give you a really cheap quote just so they can get the job, and will then increase it during the contract. Be mindful and aware of this. The most detailed quotes you get are also often the best. An organised and experienced contractor will think and list of everything on the quote, room by room, and item by time. Some contractors are more focused on details and will take longer overall, while others work fast but with less attention to detail. This depends on what’s more important to you and what you ultimately want. You also want to make sure that you hire someone who is easy to reach and is going to answer the phone when you call. 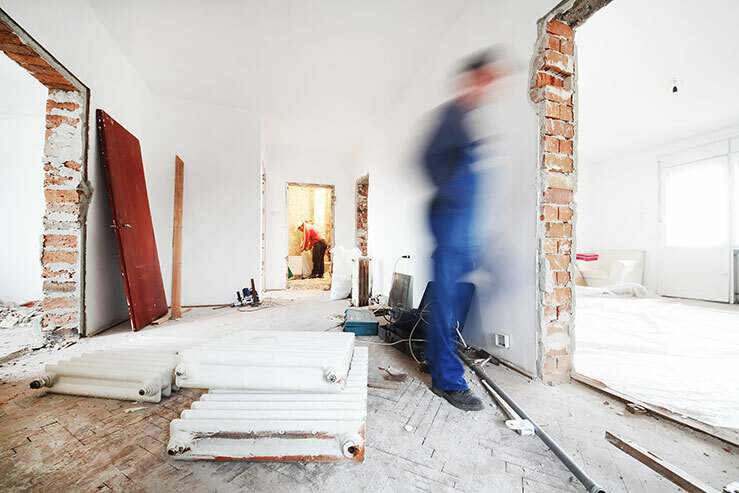 Renovation can be a stressful time and you need your contractor to be on top of it. Remember that at one point you’re gonna have to resell. Are you creating something that other people will be able to relate to? A home that others will want to buy? These are all very important questions. Look around you and at where your home is located, and don’t under- or over-do it. You don’t want to build a mansion in an area filled with small homes, or a tiny house in an affluent neighbourhood. Last but not least, never underestimate the budget plan and costs. After all, renovations are pricey, so have this in mind from the get go. People usually make the mistake of underestimating budgets. The biggest cost is usually the labour. Being realistic, especially with time frames and how those would translate into dollars, is a must. Furthermore, be prepared for surprises and things that may go wrong along the way. More often than not, when installing something, another thing will fail, and then you’ll need to spend money on fixing both things. Setting aside 15% of the overall total cost for unexpected events is a good idea as a backup. And the older the home, the more money you’re likely to have to put aside. So now you know what to avoid when renovating, you can hope that your plans run smoothly. Good luck!